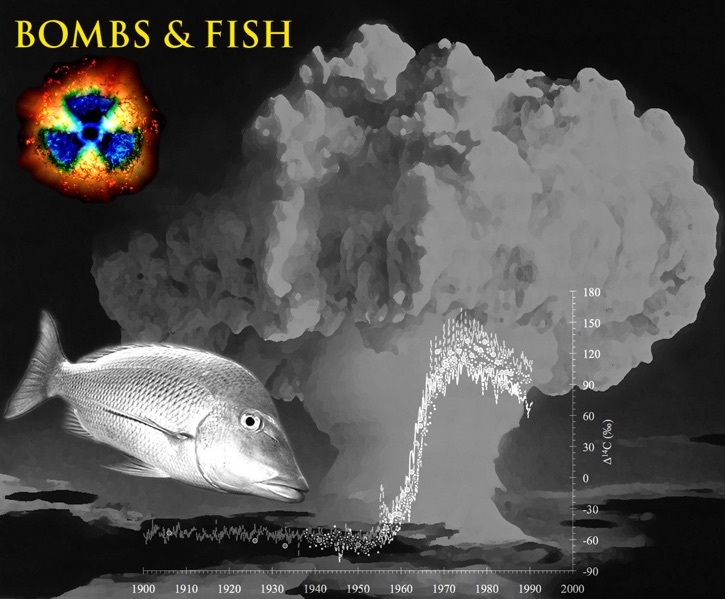 Bomb radiocarbon dating is a technique that has evolved as a unique application in the age validation of marine fishes and invertebrates. 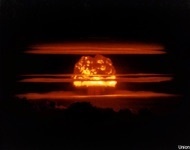 The approach relies on a conserved record of the rapid increase in radiocarbon (14C) that occurred in the oceans of the world as a result of atmospheric testing of thermonuclear devices in the 1950’s and 1960’s. 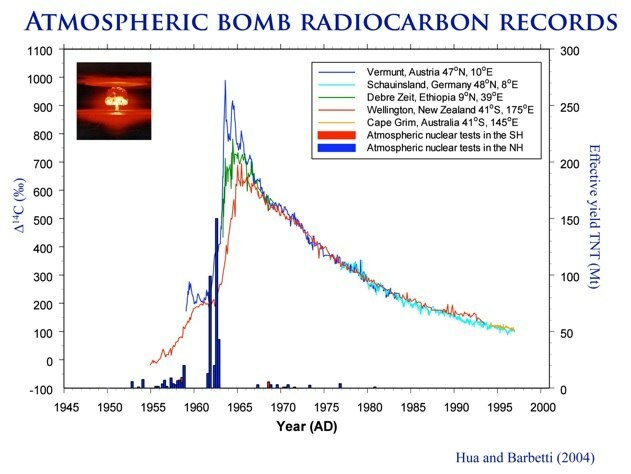 The figure shown here from Hua and Barbetti (2004) provides a comprehensive view of the rise in 14C with time with the nuclear bomb events that led to the atmospheric pulse. The change in 14C due to bomb-produced 14C, reported as Δ14C in reference to an established prenuclear 14C record, was also taken up by the marine environment and was virtually synchronous in terms of the initial rise in Δ14C in the mixed layer of mid-latitude oceans. 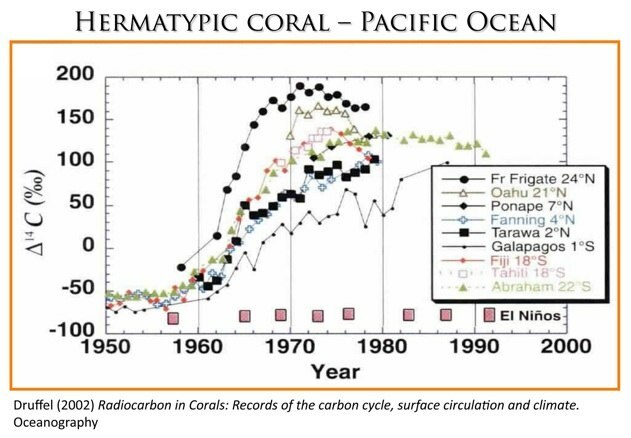 This oceanic signal was first recorded from marine carbonates in hermatypic (reef-building) corals and has since been shown to be regionally specific in terms of the magnitude and timing of the post-bomb rise, as shown in the plot from Druffel (2002). Application of the method to fishes began with an innovative comparison of Δ14C values recorded in otolith carbonate relative to regional Δ14C records from hermatypic corals. The temporal specificity of the measured levels provided an independent determination of age for corroboration of age estimates from growth zone counting in otoliths, as can be seen in this plot from Kalish (1993). 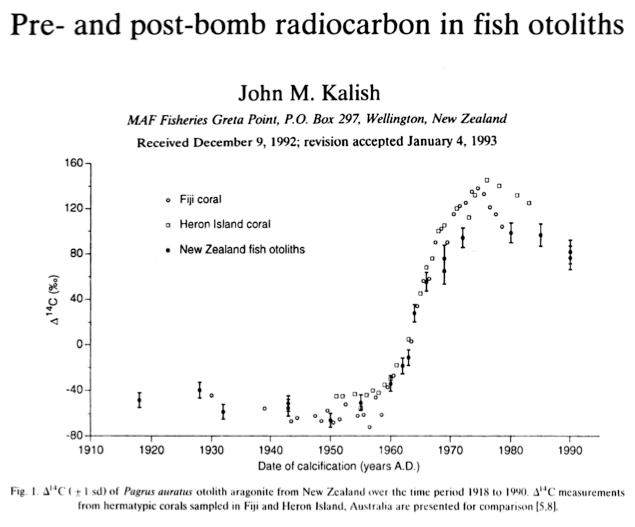 Note that the rise in Δ14C measured from aged fish otoliths coincides with the recorded pulse from regional hermatypic corals (see Bomb radiocarbon dating of three important reef-fishes of the Indo-Pacific for a recent application). 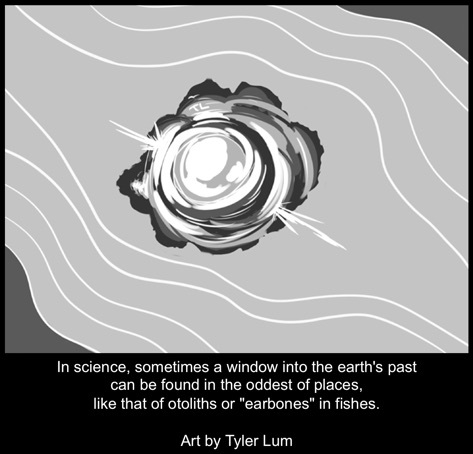 Bomb radiocarbon dating has since been applied successfully to numerous marine fishes in otolith (fish ear bone) applications (e.g. 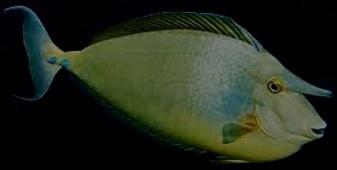 rockfishes of the northeastern Pacific), has expanded to sharks and rays using the vertebrae and fin spines (e.g. tiger shark and dogfish), and is also being used for other marine organisms (e.g. calcareous marine alga, deep-sea coral, whale teeth, and mollusks). In many cases the applications are complicated by incomplete information that leads necessarily to assumptions for conclusions to be drawn; however, the method is a work in progress and some of the work presented here works to address some of the potential pitfalls. Stay tuned for more developments from the Hawaiian Islands and Insular Tropical Pacific. In December 2013 I gave an interview with Carlie Wiener on the work that I do in Hawaii and abroad with NOAA Fisheries. The program is called 'All Things Marine' and it airs on the local news talk radio KGU760 Honolulu, Hawaii.